The thin and light 13.3-inch Toshiba Portege R700 (PT311A-00J00Q) adds something that was missing from previous Portege notebooks that business users will appreciate: fast performance. Even though it weighs 1.45kg and its base is only around 19mm thick, the Portege R700 packs in an Intel Core i5-520M CPU, 4GB of DDR3 SDRAM and a 7200rpm hard drive. The drawback, however, is that it's a notebook whose underside gets very warm and this will definitely be uncomfortable if you plan to rest it on your lap while using it. Because the Portege R700 uses a full-power Core i5 CPU in its small chassis, rather than an ultra-low-voltage processor, the heat is something that's immediately noticeable. Even if you've only been using it for a few minutes to browse the Web, you can feel the left side of the base get considerably warm. A suction fan is located at the bottom of the unit, near the front, and even if you don't block it, a steady stream of external air won't keep the internal temperature down. If you block the fan, the palm rests will also start warming up — not to the point where the laptop will become unbearable to type on — and the heat sink will get even warmer. What all this means is that while you get excellent performance and mobility out of this slender 13.3-inch unit, you also get a very warm-running laptop that can't be used on your lap unless you're wearing thick pants, or you happen to live in a cold environment. It's the heat sink on the left side of the laptop that's the culprit, and it can also become bothersome if you rest your hand to the left of the laptop, or on its left side. One way you can reduce the heat output if you really want to use the R700 on your lap is to invoke Eco mode. This drops the CPU speed down to 1.3GHz, which is a fine speed for office applications and Web browsing. When you want to undertake more taxing tasks, simply switch off Eco mode and plonk the laptop on a desk. Let's say for a moment that you will always be using the Portege R700 on a flat, sturdy table or aeroplane tray; if that's the case, then you will love its speed. Not only do you get a laptop that looks stylish and won't weigh down your bags, it will allow you to run taxing tasks in addition to regular office work. You could easily use it to edit and encode video you have just shot on your digital camera, for example. In our performance tests, the only area in which the Portege R700 proved to be weak was in the 3D graphics department; but even so, in 3DMark06 it achieved a respectable 1960 using its integrated Intel HD graphics. The CPU and hard drive proved to be fast beyond what we expected of a thin-and-light notebook. In the Blender 3D rendering and iTunes MP3 encoding tests, the R700's configuration notched up times of 59sec and 1min, respectively. In our hard drive transfer test, the 7200rpm, 320GB hard drive recorded a rate of 35.33 megabytes per second. This transfer rate has become expected of 7200rpm drives in 13.3-inch notebooks of late — the Dell Vostro V130 also recorded the same exact speed in our tests, as did the Dell Vostro V13 before it. In our battery test, in which we disable power management, maximise screen brightness, enable Wi-Fi and loop an Xvid-encoded video, the R700's 6-cell battery lasted for 2hr 26min. It's a good result compared to other recent 13.3-inch notebooks we've seen, such as the Fujitsu LifeBook Sh530, which lasted 2hr 25min, and much better than the Dell Vostro V130. It's not as long as the Samsung Q330-JS03AU, which recorded 2hr 51min (but that notebook also didn't have a full power Core i5 CPU at the helm - it ran a Core i3-350M instead). If you use Eco mode, the notebook will slow down the CPU to 1.3GHz (1.1GHz when it's idle) and lower the screen brightness. This will allow you to get much more life out of the battery when using it for office work and Web browsing. Around the edges of the Portege R700, you'll find lot of good stuff. This includes a built-in DVD burner, eSATA, three USB 2.0 ports (one shared with eSATA), VGA, HDMI, Gigabit Ethernet, microphone and headphone ports, and an SD card reader. You also get a webcam, dual-band 802.11n Wi-Fi and Bluetooth. A fingerprint reader is nestled in between the left- and right-click touchpad buttons. We like the touchpad, which is 85 x 51mm and very responsive when it comes to using multi-finger gestures for scrolling and zooming. However, we're not fans of the Portege's keyboard. The keys don't have enough travel and proper bounce-back, and they feel too slippery. Like all keyboards though, we guess it's something you can get used to. Just like the Toshiba Satellite Pro U500, the Portege R700 ships with fingerprint reader software that doesn't play nice with Firefox. In order to run Firefox, we had to first find an update for the driver. This wasn't an easy task, and we were only able to find an appropriate driver on a third-party site called Userdrivers.com, rather than Toshiba's own site. 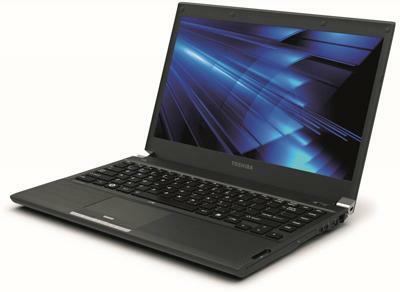 With so much power in such a slender frame, the Toshiba Portege R700 is definitely a little marvel. We like it a lot and this is not only due to its performance and small size, but also its build quality, which feels sturdy. We wish it had a better keyboard though, and that its fingerprint reader software worked with Firefox. Above all, we wish it didn't get so bloody warm. However, the heat issue can be tempered by running the laptop in Eco mode, which will make the CPU run slower and allow you to use the the R700 on your lap for longer. Overall, it's a great business laptop, but it's not without its shortcomings.